The new H2 GS is the culmination of countless hours of testing with the best skiers in the world. Legendary ski designer Denny Kidder and design engineer Will Bush sculpted and modified the new Helix H2 GS in multiple ways. First the QUADAXIAL (torsional) technology already made famous in the world record holding Quest 45 improved the H2 GS’s ability to hold angle and create space. 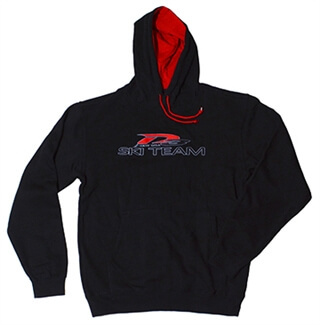 Instantly the buzz from our test team was that we had made a great ski even better. To smooth the turns the bevels were ever-so slightly softened. This made the H2 GS turn even more predictably than its predecessor. The overall rocker profile has been adjusted to create a more complete turning radius. The end result is the finest slalom course ski ever produced in our Ellensburg Washington facility. Welcome to the slalom performance future, the all new HELIX H2. Note: The GS is a softer ski than the standard H2 for lighter skiers. SHAPE – The Helix H2 GS still shares some basic DNA with the world record holding Quest 45, utilizing the same competition proven topographical shape. EDGES/BEVELS – The Helix H2 GS’s softer bevel design delivers a smoother, more consistent feel. When compared to the previous Helix design this is one of the most significant changes. The tip to tail bevel assembly creates a precise running surface for the water to flow down. We call it a bevel assembly because we use multiple radiuses in the construction of the all new H2 GS bevels. The water flow is directed very accurately down the edge of the H2 GS creating a precise feel and reducing skier effort significantly. Overall the shape of the H2 GS bevel assembly is now softer creating a smoother transition from edge to edge. CONCAVE – The aft section of the H2 GS concave has been modified to capture more water when the ski is on edge. This delivers additional holding power to the tail of the ski making it easier to keep angle across the course even when a skier has his weight slightly back of center. ROCKER – This side profile shape is hyper critical to the success of all D3 slalom skis. It can also be the most difficult feature to control as laminate lay-up can greatly affect rocker shape. We start with a longer flat spot where the Helix H2 GS draws its stable ride. Where the flat begins and ends is paramount. This controls the H2 GS’s ability to ride level and puts the skier directly in the sweet spot. Tail rocker shape is meticulously controlled and now ADJUSTABLE via our patented Rockerblock fin blocks. FLEX – In general D3 runs a softer flex philosophy than our competition. This is by design. Speed and ultimately skier effort is a result of the hull design and bevels. D3’s forgiving ride and stability come from a softer flex. We are so confident that our flex numbers are accurate we have always documented them on each and every ski we produce. 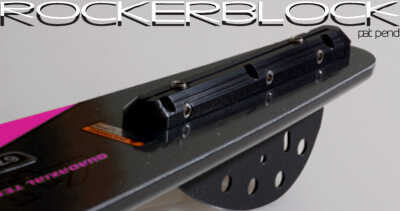 ROCKERBLOCK – Because different types of skiers have different needs we have designed two optional Rockerblock models to give skiers the ability to further fine tune their D3 ski. Now skiers with different performance requirements can fine tune their Helix H2 GS perfectly to suit their specific style. The R-45 will come as standard equipment with each new Helix H2 GS. R-30 and R-60 Rockerblock models are also available. The fore-body and tail width have been designed to work in unison resulting in a level ride that keeps the skier directly over the fulcrum point of the ski. The H2 bevel assembly has been designed softer for a smooth, forgiving ride. The water is directed very accurately down the edge of the ski creating precise direction and control. The H2 remains easy to ride with no loss of speed. The fore-body of the H2 allows the skier to easily transfer weight to the tip with minimal body movement. The H2 engages the off-side and on-side turns with minimal skier effort. A D3 exclusive. No other manufacturer is as consistent ski to ski as D3. This consistent production and attention to detail is your guarantee that every D3 is the finest ski we can produce. The rocker and flat spot are designed for a stable, center stance. The Helix comes standard with stainless steel inserts for you to mount bindings and will accommodate D3 HO and Reflex bindings. Also available with no inserts for dual–lock application. The D3 production facility located in Ellensburg, Washington USA is “state of the art” in every way. Each ski is carefully inspected and must pass strict criteria for rocker, flex, weight and flat spot before it receives a serial #. All D3 skis are documented and filed under their born-on-date and serial #. All D3 skis now come with an insert hole pattern that accommodate both D3 and HO binding plates. HO EXO Bar System requires adapter plates.